The holidays in December are filled with messages from retailers about making the season bright. The push, of course, is to buy something at their store to “make someone on your gift list happy.” Yes, giving a thoughtful gift can “make someone happy,” but I always worry about the impact this barrage of messages can have on children. To help balance the “buy happiness” message stores need to send out this season to attract customers, I try to give my children the opportunity to send “something from the heart” to make special people in their lives happy. At first, I admit, I was met with some reluctance. Making something takes time and energy, and isn’t it easier to just buy a gift? But when I reminded my children of how excited my husband and I are each time we receive something they made, they understood and agreed. – Brainstorm the materials your child would like to use. Is construction paper what he wants or would he rather use typing paper? What about heavy weight tag paper that seems more like a card? You’re little guy will no doubt have a clear idea of where he wants to start. – Bring out a variety of writing, coloring, and decorating materials. I know that my kids were always very excited to see glitter glue pens that left a sparkly trail wherever they put the glue. Ink pads and stamps, stickers, colored markers and crayons can be put in a large bowl in the middle of the work table. – Talk about holiday objects that are usually seen on cards this time of year. Christmas trees, wreaths, snowmen, reindeer, candles, Menorahs and the Kwanzaa Kinara are a few. Discuss the colors that symbolize the holiday – red and green, blue and white or red, black and green. – Discuss some phrases that are often seen in cards and listen to some ideas that your child has for his message. Short and sweet does the job, though, since it is as much the thought and effort put into the card as the actual words written. – Young children often do very well drawing a picture first and then adding words to describe what they have drawn. – Encourage your child to use inventive spelling to write letters that represent the sounds he hears in words. For example, your child may show the word love with the letters LV or LUV. No doubt the lucky relative receiving this card will know that those letters say! 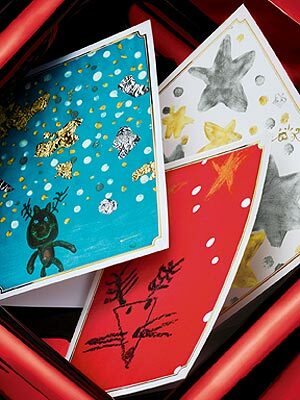 If you think that the person receiving the card will not be able to decipher the message, you can write it correctly in pencil beneath your child’s words before you mail out the card. – Make sure that your child signs his name to the card, even if this means writing just one letter. This will help your child understand that signing his card lets his loved one know he made it. – If your child is struggling to write letters clearly and legibly, give him opportunities to practice tracing letters with tracing letters worksheets. And if he seems unable to trace along the dashed-line letters, try using just tracing worksheets to help him get used to following along a dashed line. – Address the envelope yourself if your child is not quite able to do this yet. But let him put on the stamp and drop the card into the mailbox to complete the card-sending process. Visit Renee at www.schoolsparks.com for information on helping your child develop important school-readiness skills. On her site you’ll find a free kindergarten readiness test plus hundreds of free kindergarten worksheets including shapes worksheets, dolch sight words, and color words worksheets. What a fun idea. It would make a great card, especially for family member.